The brisk mountain air filled with delectable Israeli cuisine, the burning smell of herbs hustling in the air, the alluring view of milky waters of the Parvati river, fabulous snow capped mountains and the perfect feel of serenity, this is what welcomes you at the Parvati valley, one of the loveliest Himalayan valleys in India. Until you step into the serene aura of Parvati Valley, an idea of the tranquility and peace this place offers, remains inconceivable. 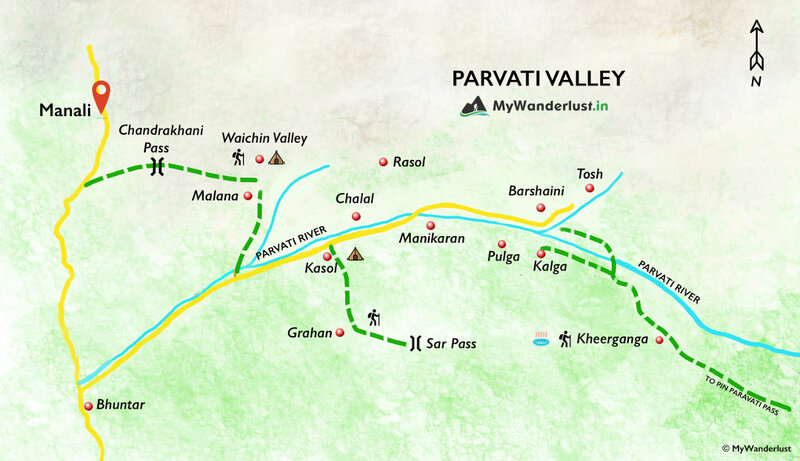 Here is a comprehensive guide for you for a thrilling trip to the Parvati valley along with some offbeat places in the valley so that you can make the most of it. The brisk mountain air filled with delectable Israeli cuisine, the burning smell of herbs hustling in the air, the alluring view of milky waters of the Parvati river, fabulous snow capped mountains and the perfect feel of serenity, this is what welcomes you at the Parvati valley, one of the loveliest Himalayan valleys in India. Until you step into the serene aura of Parvati Valley, an idea of the tranquility and peace this place offers, remains inconceivable. Here is a comprehensive guide for you for a thrilling trip to the Parvati valley along with some offbeat places in the valley so that you can make the most of it. Bhuntar, right where you enter Parvati valley is the nearest airport. You can also reach Parvati valley via bus. The roads are good so you can hire a taxi, or self-drive to reach here if you like. If you're coming via public transport, take any bus on the Delhi - Chandigarh - Manali route, and get down at Bhuntar which is the connecting bus stop. From Bhuntar you'll get a local bus for Kasol all the way to Barshaini.